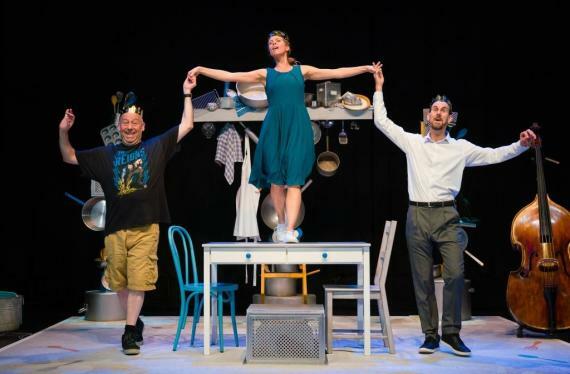 Theatre Alibi makes new work for all ages that moves freely between the intimate and the epic and aspires to be inventive, joyful, moving, vivid, intricate and ambitious. Our work combines performance with other art forms including animation, film, puppetry, photography and music. Exeter is our home but we perform regionally, nationally and internationally in a huge range of places and spaces so that people of all ages and backgrounds can enjoy our work – from large theatres to village halls and tiny Devon primary schools. Our productions for adult audiences include Fish Eye, Falling, Hammer & Tongs, Curiosity Shop, Goucher’s War,The Ministry of Fear, Cobbo, Spies, Caught, One in a Million, Shelf Life and Little White Lies. Shows for children include Table Mates, Apple John, The Boy Who Climbed Into The Moon, Olive & the Dream Train, I Believe in Unicorns, The Crowstarver, A Flying Visit, Why the Whales Came, High Muck-a-Muck, Teapot, Lost & Found, Bonjour Bob (shortlisted for the Brian Way Award for new writing), Wild One, and You Can’t Catch Me. Theatre Alibi is funded by Arts Council England as a National Portfolio Organisation and Exeter City Council.